How does Next Scale Stop work? In cold water, calcium ions (Ca2+), magnesium ions (Mg+2) and bicarbonate ions (HCO3-) are surrounded by "layers" of electrochemically - attracted water molecules, which "insulate" against the natural tendency of the oppositely-charged ions to come together and form crystals. 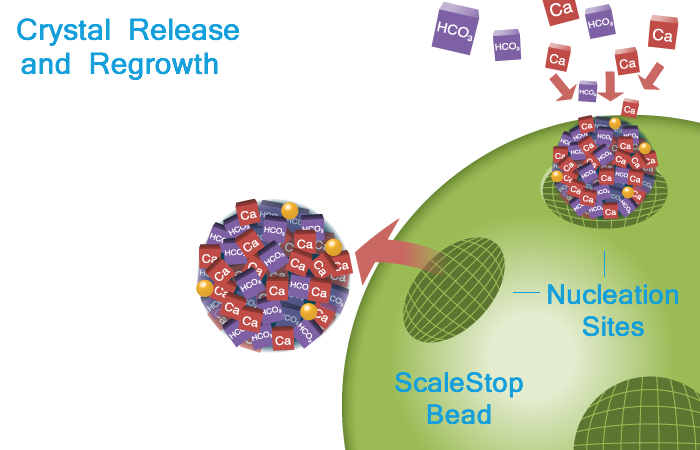 Atomic level templates on the surface of the Next Scale Stop media act as catalysts and reduce the ability of water molecules to prevent calcium, magnesium and bicarbonate ions from coming together to form crystals of calcium and magnesium scale. 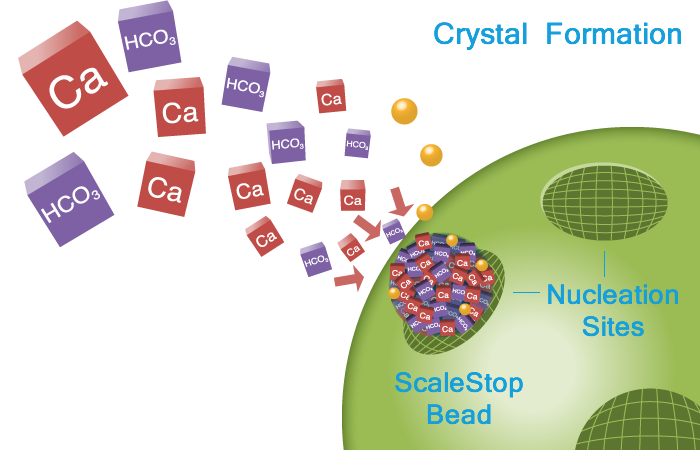 This process that we refer to as Template Assisted Crystallisation (TAC) results in the creation of microscopic crystals of scale (seed crystals) which rapidly form in the treated water, not on the contact surfaces of the water system, and are carried downstream in colloidal suspension through the water system. Next Scale Stop has been rigorously tested and adopted by some of the World’s leading equipment manufacturers, distributors and end users. Tested and approved in water heaters and boilers with AO Smith, Noritz, Rinnai, Lorenzetti and Takagi. Tested and approved in food services equipment with Groen combi ovens, Manitowoc ice machines and Concordia Coffee machines for which it is standard protection. Tested and approved by restaurant groups including Global approval with McDonalds. This is a very impressive provenance for NSS units which have demonstrated time after time to some of the most demanding and successful companies in the World that they are the scale protection system to rely on. 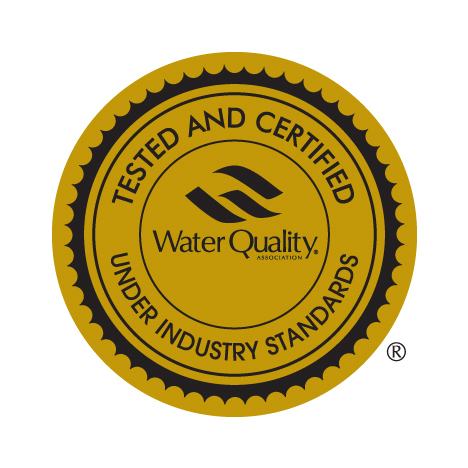 Next ScaleStop provides potable water which has drinking water safety certifications under NSF/ANSO Standard 61, BS6920 and is a WRAS approved product.